The Foundational Leadership Program (FLP) is the seventh leadership program that RIGSS has launched. It is specifically designed for young, entry-level professionals from various sectors. The program aims to provide participants with professional orientation and grooming, skills development, and attitudinal transformation towards becoming future leaders. FLP will possibly be the first leadership training for many of the participants, and would thus serve as a springboard for their leadership career. FLP is a four-week course, of which three weeks is focused on promoting better understanding and appreciation of the evolution of Bhutan as a sovereign nation-state; our challenges and vulnerabilities in the changing global and regional context; values and ethics; foundational leadership skills and related tools; right mindset and motivation for public service and a better understanding of Gross National Happiness and its practical interpretations. 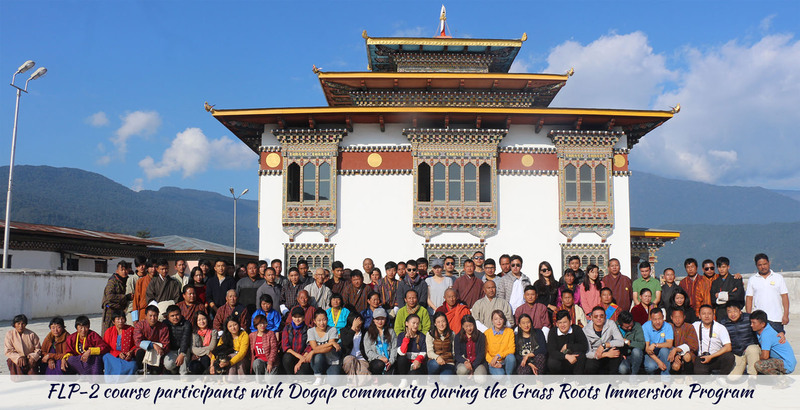 Participants also undergo a week-long immersion program, where they spend a week in a village to experience rural life first-hand, and to assess the potential and impact of development interventions in transforming people’s lives. This is expected to give the young participants a deeper understanding of the challenges and opportunities in our rural communities that will stimulate them to reflect on our national priorities and policies. All aspiring and eligible candidates from the civil service, autonomous agencies, CSOs and private companies, and those nominated from the Corporations, SoEs and Armed Forces will be invited to register and apply for the course through the RIGSS Online Application System, which will open at 11.00 AM on 23rd March 2019. Registered users will be given access to the Online Admission System. Online application system will close at 5.00 PM on 3rd April 2019. Applicants must submit their written works and other credentials on or before this date. Further, extra-ordinary achievements, which are supported by proof of recognition/reward, will also be awarded additional points in the final selection. A panel of experts will evaluate the written works submitted by applicants. Based on evaluation of the written works, marks obtained in the Class X and XII Board examinations, applicants will be shortlisted and names of the shortlisted candidates will be announced latest by 5.00 PM on 20th April 2019 on the Institute’s website. A Skype video interview will be organized during 23rd April – 25th April 2019 for all shortlisted candidates. The interview will last for 15-20 minutes, and scores obtained from the interview will be used in the final selection of candidates. The Institute will schedule the interviews for all shortlisted candidates and intimate the date and time in advance. Shortlisted candidates will have to give an online psychometric test as a part of the final selection during 23rd April –25th April 2019. The candidate shall complete the test within the stipulated time. Scores obtained from the test will be used in the final selection of candidates. Test instructions and deadline will be emailed to candidates soon after the shortlisted candidates are declared. An applicant should maintain a minimum gap of five years between two RIGSS courses (FLP/YPLP/SELP). For example, if a candidate is selected for the FLP course, he/she will be eligible for the YPLP course only after five years of completion of FLP.